Sonic Triangle: Back from the dead! But better late than never, as they say. (I sometimes think I should adopt that saying as my motto, as it applies to so many things in my life). We finally released a song! Two songs, in fact. One’s called Mercury, and it has a video as well! The other is called Homesick, and it doesn’t have a video. (Actually, it sort of does, but I doubt that that video will ever see the light of day, so we’ll just pretend it doesn’t). We’re pretty happy with both of them, and I hope you enjoy them too. As to why it’s taken five years, I’m not actually sure. It’s not as if we haven’t been doing stuff… Alex sent round the first demo of Homesick way back in spring 2011, and we’ve actually been working on it (and about seven or eight other tracks, some of which we might finish and release at some point) on-and-off pretty much ever since then. We’ve just all been quite busy with other things, and haven’t got to the point of having anything we feel happy enough with to release until now. A shot from the Mercury video, featuring our very talented singer. Our process of recording hasn’t changed a great deal since I first wrote about it. Most of the instruments are still played on my Casio keyboard, though when I moved house a few years ago I brought the Technics electric piano that I inherited from my uncle out of storage, so the piano parts are now played on that, which is a big improvement. We did some recording with the glockenspiel, but it doesn’t feature on either of the new tracks. I think the way Alex creates the MIDI demos and edits the final versions has changed a bit, but I don’t know the details. I just play my keyboard and piano, then Alex goes away with the sound files and a few hours later a marvellous mix appears that leaves me thinking “Did I really play all that?”. We’ve now dragged ourselves into the 21st century and created a Facebook page, supplementing our rather minimalist website. I think we always had a Twitter account, it just hasn’t been used much. (In other music news, I’m looking forward to seeing Belle and Sebastian live next month… they’ve been on my list of bands to go and see for even longer than it’s taken us to finish Homesick 😉 ). I decided it was about time to upgrade my ageing Skoda Fabia to something better. The Fabia’s been a good car mostly, certainly better than the Fiat Punto I had before, but it was getting to the age where it was accumulating niggling problems at an ever increasing rate: one of the back doors had got jammed shut (again) which, aside from being annoying in itself, would have needed fixed before the MoT; the body was no longer watertight and I would frequently find the carpets saturated with water or the inside of the windscreen soaking wet after a rainy night; the screen wash tank had started to leak and there was possibly a slow coolant leak as well as I’d had to top it up a few times in the past year or two; the engine was sounding more and more reluctant to start and I was worried that some day it would no longer start at all; the handbrake seemed to fail every year and need expensive repairs no matter how gentle I tried to be with it. 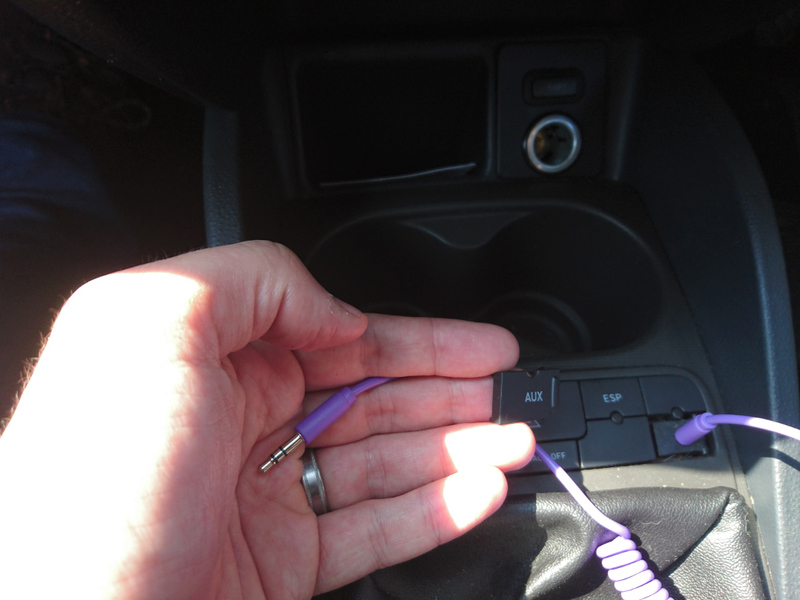 Worst of all, the stereo I installed had broken and I was stuck with an old one with no aux input to connect my phone to! The engine itself still seemed to work OK (it had been pretty reliable, only needing a few replacement ignition coils over the years) but had racked up over 110,000 miles which is a fair amount for a small petrol. So, with the wedding budget finally under control, it was time to look at new cars. 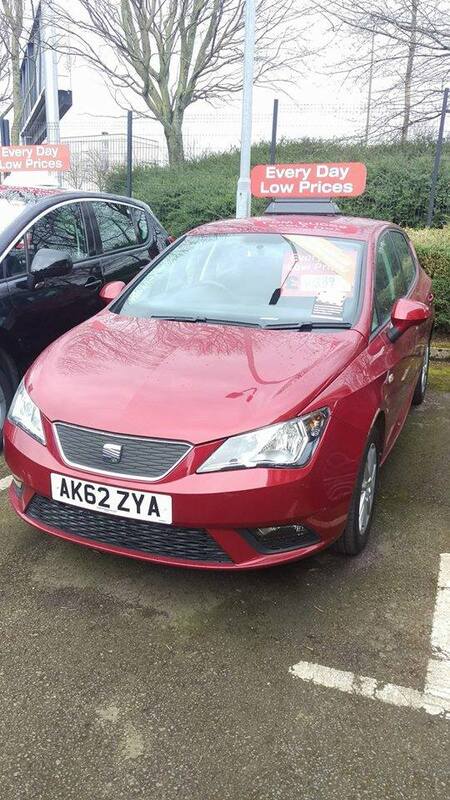 I’d been wanting to upgrade to something much more fuel efficient, and this eco model Seat Ibiza seemed to fit the bill nicely. Its carbon dioxide emissions per kilometre are so low that it’s exempt from road tax (even better than Laura’s £30 road tax Leon), and whilst I wasn’t naive enough to expect it to actually manage the quoted 80 miles per gallon on realistic journeys, it would certainly be a lot more economical to run than anything I’d owned previously. It also met my other requirements – 5 door, no smaller than the Skoda… and of course an aux socket on the stereo! Plus it’s a much nicer colour than my old beige car, which probably swayed me a bit. I arranged to buy it the same day, after a quick test drive to make sure the 3 cylinder 1.2 litre engine (very small for a diesel) wouldn’t feel too underpowered. It was fine – while it’s not going to win any awards for acceleration, it actually feels quite a lot more powerful than either of my previous cars, so I was happy with that. I also checked the crash safety ratings after reading that one of the reasons this model is so efficient is that it’s unusually light – but thankfully, it has very good Euro NCAP ratings, so there’s obviously more to crash safety than just the weight. (I won’t bore you with the details of the long saga of waiting for the small dent in the bonnet to be repaired that ensued after that. Ordinarily I would have been pretty annoyed and frustrated to have to wait two weeks longer than planned to pick up my new car, but since I ended up being stuck in bed for most of those two weeks with a horrible dose of flu followed by a chest infection, I had other things on my mind. I also lost my voice for a while, which gave me a good excuse not to have to bother with all the interminable phone calls to the dealer and get Laura to deal with them instead 😉 . And at least they were nice enough to throw in a full tank of diesel and a packet of Mini Eggs as compensation for the delay). Of course, the most interesting question for me was: what would the fuel consumption actually be like? I didn’t expect to get 80mpg (except possibly when driving downhill at a constant speed of 45mph in top gear with a strong wind behind me for miles and miles) but I was hoping it would at least be impressive compared to my own car. I wasn’t disappointed. I’ve had the car a few weeks now and have been keeping a close eye on the miles per gallon indicator on the trip computer*. On journeys in town, with a lot of stopping and starting and waiting at traffic lights, the mpg still usually gets into the high 40s (the Skoda would have been at about 30mpg on those trips). 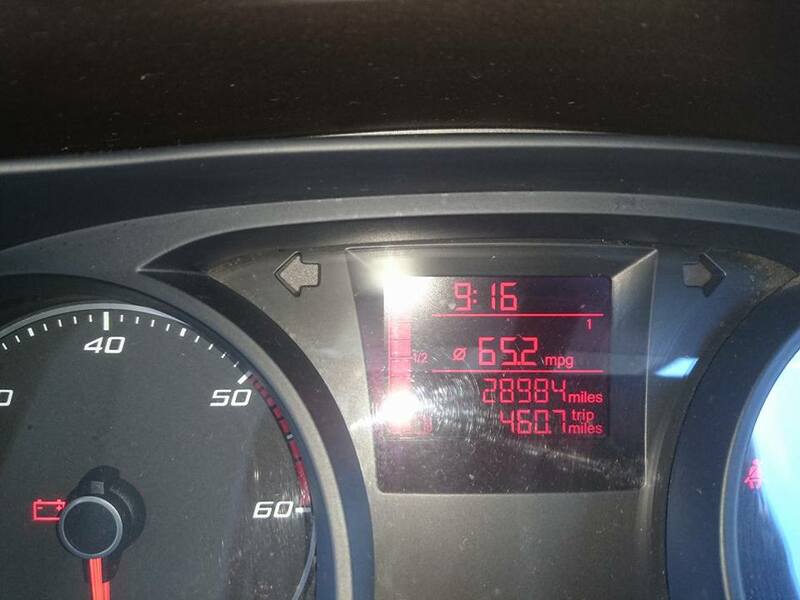 On medium length journeys with a mix of city streets and motorway/dual carriageway type roads, it manages well over 60mpg – in fact, nearly 70 on my journey to work this morning. Pretty good for a standard non-hybrid, reasonably sized car. The trip computer shows a miles-per-gallon value that the Skoda’s one could only dream of. If trip computers can dream, that is. They’re probably not that advanced yet. One of the fuel saving features, though, is slightly disconcerting. If at any point you put it in neutral with the handbrake on and take your foot off the clutch, the engine turns off to save fuel. The first time this happened I thought it had stalled and was about to hastily try to restart it before the lights turned green, but as soon as I put my foot back on the clutch the engine came back on very quickly. At first I shied away from letting it do this, scared that the engine wouldn’t come back on and I’d be stranded in the middle of the road, but after experimenting with it a bit I got less cautious. I use it all the time now when I’m going to be stationary for more than half a minute or so, and the engine always restarts quicker than I can even put it back in gear. Sometimes it restarts itself before I put the clutch in – I assume this is to make sure the battery doesn’t get drained too much. (I think memories of my mum’s long drawn out attempts to start her ageing Fiat Uno on damp days probably contributed to my anxiety that the engine wouldn’t restart! Actually I had similar worries when I first got a gas boiler without a pilot light, that it wouldn’t be able to light the burner reliably. One of these days I’ll convince my brain that this is the 21st century and being able to start a diesel engine or light a gas burner automatically is really a solved problem now). One thing though: no Haynes manual for this model! I guess that’s no big deal as I never ended up doing as much work myself on my previous cars as I’d planned to do (just replacing the spark plugs and coils, changing the oil, and fixing the heater blower) but I’ve always had a Haynes manual… I feel lost and disorientated looking under the bonnet without one. Much as I like some of the other books that Haynes have branched out into, it seems they’ve dropped the ball a bit on their core business of keeping up with new car models, sadly (I noticed they don’t do one for Laura’s car either). * yes, I know trip computers tend to overestimate the miles per gallon, so it’s probably not really quite as good as it looks from those numbers, but it’s still by far the easiest way of seeing roughly how much fuel you’re using on each individual journey.